Hello lovely people. I hope you are having a marvellous weekend? We actually have a little drop of the above mentioned here in the SW UK today - all I keep hearing in my head since making this card is The Temptations singing, 'I Got Sunshine On A Cloudy Day' - for the benefit of those too young to remember Tamla Mowtown, here it is. It was made in the day when you could understand every word that was sung - Oh my word . . . I've turned into my mother!! OK, here is my take, explanation at the end, as usual. I knew that I wanted to use a nice, bright, cheery colour to brighten the very dull and very rainy days we have been having lately here in our part of the UK, so my first thing I did was reach for my yellow card-stock! I cut a panel the size I wanted for my first layer and then cut a white piece the size I wanted for my focal layer. 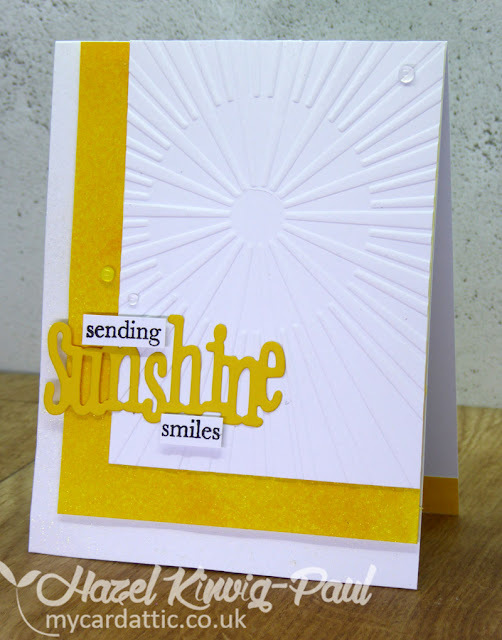 Then I remembered I had a 'Sun Rays' embossing folder by Crafts Concepts and run the focal piece through my Cuttlebug. 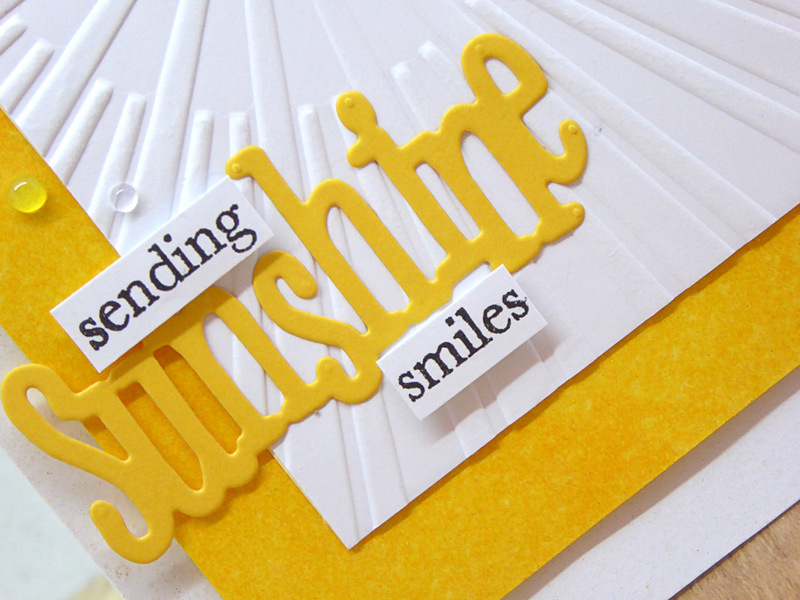 Next, I remembered I had die cut the word 'sunshine' out of yellow card-stock a very long time ago, so I dug that out. My first layer of yellow card-stock was lighter than the die-cut word and I had completely run out of the other yellow (note to self, must order more), so I ran my 'Daffodil Delight' ink pad over the lighter layer (Daffodil Delight was the colour of my die-cut word) and sprayed with my home-made gold shimmer spray - a little more added sunshine - you are getting the gist of it here now aren't you? I flush mounted the focal piece to the yellow layer and then added that with some foam for dimension. I finished the whole thing off with a couple of little stamped words from Hero Arts 'Everyday Messages' - which is a marvellous little set for addition greetings - some Glossy Accents 'dew drops', and there it was, exactly as I had envisioned it! Have a wonderful Sunday and upcoming week! thank you for the sunshine today - and love your card and the remembrance of that song! it's been raining most of the week here but we needed it so badly that i'm not complaining too much - enjoy the rest of the weekend! Awesome card! Love how bright & cheery it is! The DIY glitter paper is awesome. Thanks for playing along with us at CC&S! Now that song will be playing in my head all day long...but I love it so no worries there! I love this card...yellow is my favorite color...hard to be blue around yellow right? Fab cas card Hazel. Hope you get more sunny days sooner rather than later. That is one sunny card Hazel. Nice. Fabulous song and even more amazing card....love all that wonderful sunshine. Love your take on the sketch. Fabulous. Thanks for joining us on the weeks CC&S challenge. What a fun and cheerful card. Thanks for the ear worm, BTW. LOL. Your wonderful card just brightened my day! 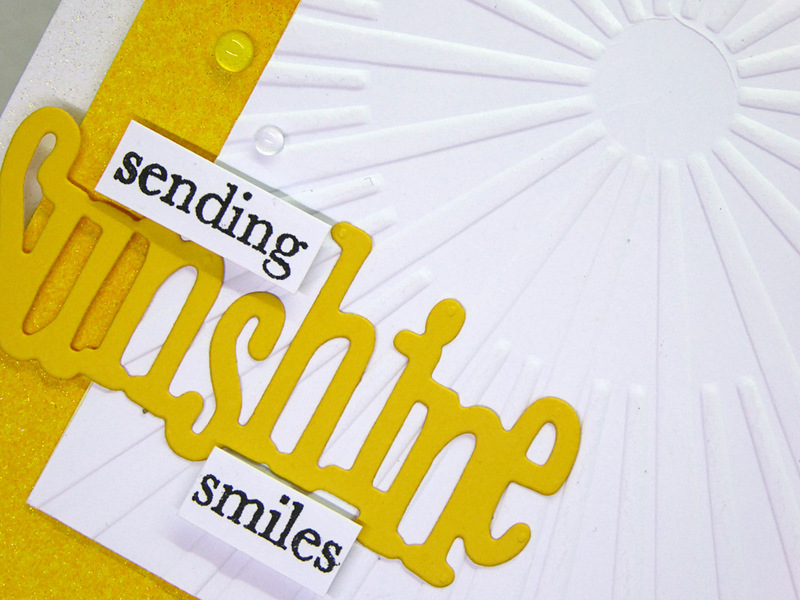 Your sunburst embossing adds some incredible texture and a great design element. Love it! Wish we had sunshine here today. Boiler broke down on Sunday. 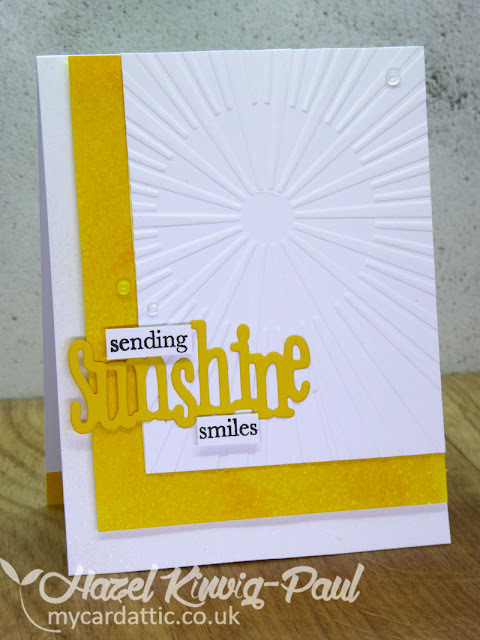 What a great CAS card I love the embossing in the background and the pop of yellow. Thanks for joining us at CC&S! Thank you so much for your sunny card to brighten up our gloomy, wet day! It is truly a delightful card and a winner in my book! Sorry for being so behind in my commenting! This is such a happy, fun card, Hazel! All that yellow makes me smile! Love the embossed sunrays!